No matter where you are, I'm sure you heard of this event. No matter your views on America, these were people, just like you and me. 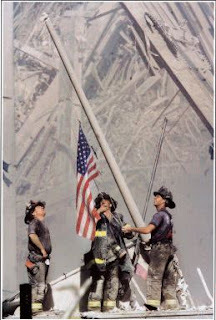 Now, September11News.com, in association with art.com, The Record (North Jersey), and photographer Thomas E. Franklin, present the original image that defined America's new spirit. Available as 18x24 or 24x36 wall poster. Click here for more information on the FDNY - Ground Zero Spirit poster.